No worries — it’s not me who’s weird, broken and headless. On second thought maybe weird does apply: Being an expat and living in foreign countries is often considered weird by the stay-at-home tribes. Tomes have been written about the benefits and sacrifices of living a nomadic life and many profound and high-minded epistles float around in cyberspace, so no need for me to add to those. Instead, let me offer up a trivial observation of my own: Living and traveling abroad you become aware of all sort of things that you’d never see or pay attention to at home, such as mannequins. (I did say trivial, did I not?) Once I was so enlightened, I took my camera and had some fun with it. Oh, that face! I took this one in Tirana, Albania a couple of years ago. In spite of her sparkly party dress, her expression speaks of great suffering. Not surprising, having an arm ripped off. Her sisters next to her seem to have a skin disease, not to speak of no head. In Turkey last year, I wandered around the wonderful market in Fethiye early one morning and found the venders not quite finished setting up their wares, so I shot this scene. Years earlier I would have just walked passed it. I trust you have faithfully followed this blog, and know that I spent a good number of years in Armenia, a small country in the Caucasus Mountains, where people eat a lot of yogurt, although they don’t all live to be a hundred. They do all shop at the sprawling Hrazdan Market. I have also spent time strolling around there, looking for treasures made in China or Turkey. Available is more or less everything created by man and beast. I missed seeing the scene on the photo below, but was happy to find the picture on Flickr.com. And since we are now in Armenia, this is a photo I took of a couple outside a shop in the center of the capital Yerevan. Not a marriage made in heaven, it looks like. I was visiting my native country of The Netherlands last July and strolled by this bone yard in the window of a upscale shop in the center of Amsterdam. It’s a bit painful to watch, isn’t it? The next photo was taken in Istanbul, Turkey, but sadly not by me. However, I felt it was of the essence to show it to you. The photographer Paul Keller calls it the diaper mannequin. It was taken in front of a sanitary supplies store. And now my most favorite mannequin photo to date, taken in Paris, France a few years ago. My prince and I were wandering the dark streets after having enjoyed a fabulously expensive dinner. We passed this window of a shop which apparently catered to pregnant brides. All I did was shoot it with my little idiot-camera, and somehow it managed to come out looking like this. A month ago or so I took a picture of a bunch of naked mannequins stashed in a corner near the fitting room of an upscale department store in Virginia, USA. I decided not to show it here because it was kind of boring. They were so perfect in all their naked glory — not a scratch on their skinny bodies, no interesting expressions, no missing limbs. They just lacked that touch of . . . je ne sais quoi. So this is it for now. May you be inspired to shoot your own mannequins. 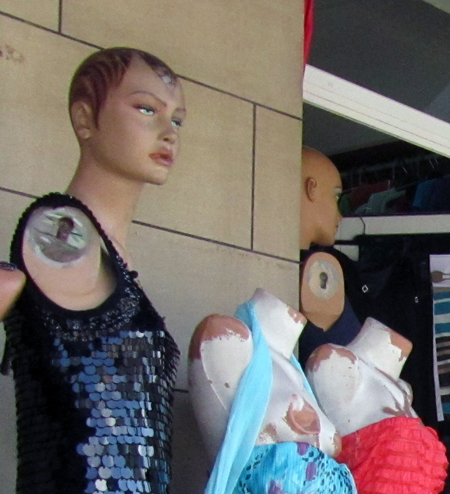 Have you ever noticed funky mannequins or interesting shop windows? Domestic or foreign? If you have photos send me a link! These pictures are hilarious. I have to say, I do like the mannequins with fiberglass hair that’s built into the mold… less scary than the ones with hair attached! Wow, so much variety. You make mannequins such an interesting subject. I’ve always taken them as quite boring before yet some of those facial expressions are fabulous. Love your stories. See you soon. I am always amazed for your ability to capture the humor in most unusual places. Truly a unique look at mannequins…I will never admire a shop window display in the same way. I learn from other writers, bloggers and photographers! Ours can be so boring and conservative. Oh.. thank you! It is a really grim, very cold and wet day here in London, UK and this post has made me laugh so much.. bless you! The villainous face on the man with the moustache was brilliant.. he looked just like a certain individual who has been arrested for doing very dastardly deeds here in the UK. Keep the posts coming lass.. you surely do amuse us, your devoted followers? I live to entertain, so thank you for telling me you enjoy my tales!